As I couldn’t do the Chevin Chase due to Christmassing in my native Saltburn this year I thought I’d have a go at this less heralded Christmas cracker. The weather was sunny with only a light breeze, so perfect for running, and despite the previous day’s torrential rain the forest tracks had held up well. It’s a 3 lap race which means there’s quite a lot of up and down compared to the race’s length (1329ft in 5.5 miles). I found I could catch up a lot of time and positions on the fast, technical downhill through the woods which finished each lap, so wasn’t too disappointed about my less-great uphill running. I enjoyed the race much more than the Stoop before Xmas, finishing 16th of 154 in 45.27. The winner was Aidan Rigby in 39.52. First lady was his sister Alice Rigby in 49.27, both in junior category. 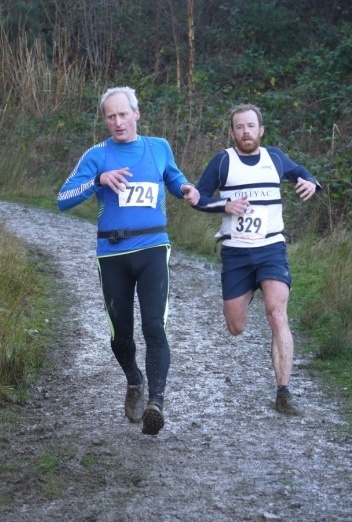 From the pic you look good Graham , 45:27 is a good result considering 5.5 miles of up and down course ,the pic shows the footpath is really muddy while you are passing another runner downhill , that is a strong performance ,well done . Looking good there Graham, well done. That hill looks pretty steep and a great action shot! Did you have to leap over the photographer as well?